ABSTRACT: Finite projective geometry explains the surprising symmetry properties of some simple graphic designs-- found, for instance, in quilts. Links are provided for applications to sporadic simple groups (via the "Miracle Octad Generator" of R. T. Curtis), to the connection between orthogonal Latin squares and projective spreads, and to symmetry of Walsh functions. We regard the four-diamond figure D above as a 4x4 array of two-color diagonally-divided square tiles. Let G be the group of 322,560 permutations of these 16 tiles generated by arbitrarily mixing random permutations of rows and of columns with random permutations of the four 2x2 quadrants. 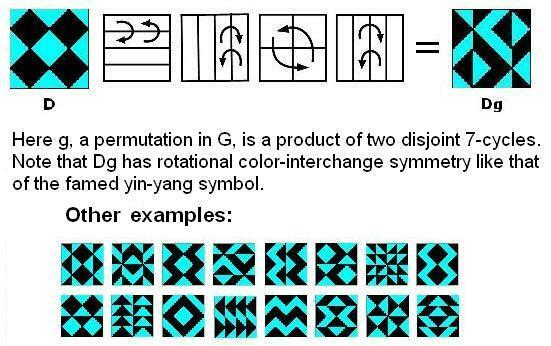 Some of the patterns resulting from the action of G on D have been known for thousands of years. (See Jablan, Symmetry and Ornament, Ch. 2.6.) It is perhaps surprising that the patterns' interrelationships and symmetries can be explained fully only by using mathematics discovered just recently (relative to the patterns' age)-- in particular, the theory of automorphism groups of finite geometries. This can be seen by viewing the 35 structures as three-sets of line diagrams, based on the three partitions of the four-set of square two-color tiles into two two-sets, and indicating the locations of these two-sets of tiles within the 4x4 patterns. The lines of the line diagrams may be added in a binary fashion (i.e., 1+1=0). Each three-set of line diagrams sums to zero-- i.e., each diagram in a three-set is the binary sum of the other two diagrams in the set. Thus, the 35 three-sets of line diagrams correspond to the 35 three-point lines of the finite projective 3-space PG(3,2). The underlying geometry of the 4x4 patterns is closely related to the Miracle Octad Generator of R. T. Curtis-- used in the construction of the Steiner system S(5,8,24)-- and hence is also related to the Leech lattice, which, as Walter Feit has remarked, "is a blown up version of S(5,8,24)." For some context, see Reflection Groups in Finite Geometry.